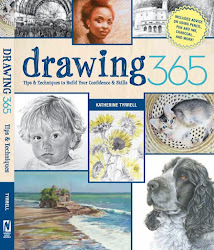 I've been a member of Urban Sketchers from the very beginning - having joined in October 2008. 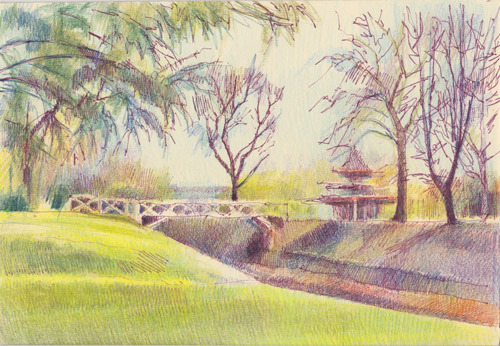 I'm very pleased to say that I'm now also a founder member of the new Urban Sketchers London blog - which you can find at http://urbansketchers-london.blogspot.com/. 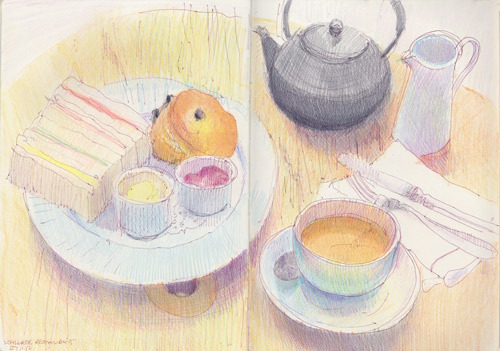 Once, we've got settled into the new blog (and I've sketched a cup of tea on location somewhere in London! 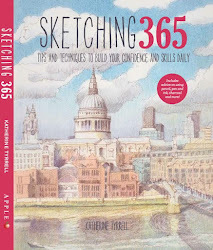 ), more London sketchers will be joining us. We'll be telling people interested in joining the London Urban Sketchers how they can do this in due course - in a post on the new blog! It's worth noting that all the sketches you will see on this new blog will always be drawn in freehand, on location in front of the subject. They will always be real places - and we'll always tell you the location of the scene which has been sketched. Any new members will need to sign up to sticking to the Urban Sketchers Manifesto - see below. Why not subscribe now to make sure you don't miss a post. 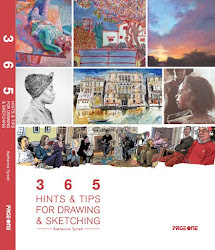 The subscription links are in the right hand column of the blog - just below the Urban Sketchers Manifesto. After limbering up with Mr Bonington (see Wallace Collection: Sketching Venice by Bonington), I moved to the next gallery at the Wallace Collection and got to grips with a big painting of Venice by Giovanni Antonio Canal, better known as Canaletto, (1697 - 1768). I had a lot to choose from! Canaletto is one of those painters who I find is liable to induce blind panic due to the sheer size of some of his paintings and the amount of perspective involved. I picked one of the less complicated ones! 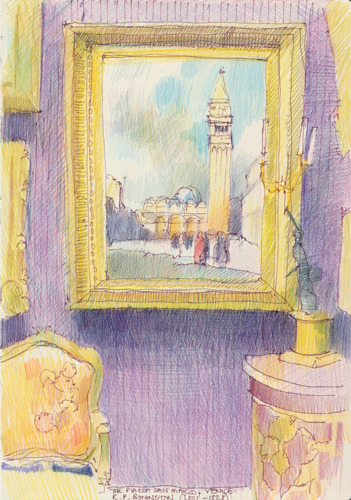 The sketch is of Canaletto's painting Venice: the Bacino di San Marco from San Giorgio Maggiore and it can be found in the West Gallery on the first floor. These are some of the other paintings in the West Gallery. Besides works by Canaletto, it also includes a few paintings by Francesco Guardi (1712 - 1793) and some imitators of Canaletto. One of the reasons I like sketching paintings in art museums and galleries is that it's one of the best ways I know of learning how a composition works, the real colours involved in the palette and the real tonal values of seemingly light or dark parts of a painting. the apex of the triangular quayside in the foreground is however on "a third"
there's a lot more cream in the sky than I first realised - which warms the painting up. This is what the Wallace Collection website has to say about this painting. One of a pair of unusually large views, depicting the Bacino di San Marco from opposing vantage points. 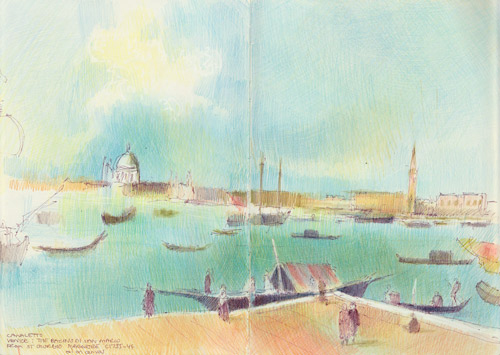 Here the viewer is placed on the steps of the church of San Giorgio Maggiore looking across the Bacino di San Marco towards the Canale della Giudecca on the left, with the opening of the Grand Canal in the centre of the canvas, and the Campanile (bell-tower), the Piazzetta and the Doge’s palace on the right. It is an attractive, clearly identifiable view of a type calculated to appeal to the Grand Tourist, with picturesque elements of local colour reinforcing the idea of Venice as an exciting cosmopolitan centre. Paintings from the past are also a jolly good way of finding "views" of a place or what I call places to paint in The Art of the Landscape. This particular one is a classic and quite possibly overdone view of Venice - but it's certainly one which presents a challenge. This is the location of the view in Venice. The painting is of the view from the island of San Giorgio Maggiore - looking northwest to the buildings either side of the Grand Canal - from Santa Maria della Salute in the west to the waterfront buildings of the SanMarco Sestieri in the middle and the east. I chose it because I turned a corner and this painting just grabbed me and insisted I sketch it. I never demur when this happens. Maybe it was something to do with the fact that it looked unfinished. Maybe it was the composition. It's usually about the colour when this happens and I suspect it was in this case. The web version on the Wallace Collection website definitely does not do it justice. The context of the complementary colours of purple walls against old gold certainly got my retinal receptors zinging. I learned that the Wallace Collection has one of the best collections of oil paintings and watercolours by Richard Parkes Bonington who died age 26 from consumption. This painting was started in the year he died. The Wallace Collection is fortunate to own probably the finest collection in the world of paintings by Richard Parkes Bonington (1802-1828) - ten oils and twenty-five watercolours. They represent most of his major areas of interest, ranging from richly costumed historical scenes to views in France and northern Italy, particularly Venice. Last Friday I was totally clueless. I trotted off to meet up with the Drawing London Group without checking the location, taking the print-out of the email or taking my mobile with me! Which is how come I came to draw paintings of Venice by Bonington and Canaletto in the Wallace Collection (to follow in the next post) - while everybody else was sketching at the Museum of London. Anyway, I had a great time followed by a visit to the Wallace Restaurant (run by the omnipresent Peyton & Byrne) for a very late lunch which turned into a Cornish Cream Tea instead as they'd run out of the dish I wanted for lunch. 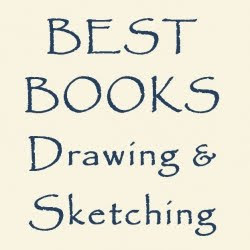 I'll get verbally shot if "he who must not be bored while I sketch" sees this! Cream teas are banned - we're both on a diet! As always I got some funny looks from the waiters while drawing this before eating. I then progressively ate my way through it very slowly while getting the colours right.